Joan George’s Merchants in Exile: The Armenians in Manchester, England, 1835-1935 is about much more than the title implies. In addition to synthesizing the story of Armenians in Manchester–including but not limited to international merchants of textiles and other goods–George offers a detailed chronicle of the attention that was paid in England to the atrocities taking place in the Ottoman Empire by Armenians, by the British public, the press, and political figures in London. The British press, she demonstrates, made the public aware of the Hamidean massacres of 1895-96 and the larger genocide of 1915, and numerous Parliament deputies and even prime ministers delivered speeches showing sympathy and consternation, but sympathy without assertive action of course did little. Some in power contradicted themselves, like William Gladstone, who on some occasions showed a desire for strong action, while other times wondered why the Armenians in Turkey could not defend themselves. The author provides all this, in great detail, side by side with the story of the evolution of the local Armenian community and the many facets of its social and spiritual life. 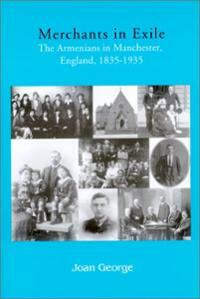 Some parts of the book might seem to hold limited interest for outsiders to the Manchester community, such as the full membership rosters for church committees and full lists of members of certain families. Other parts might read like personal memoir, for instance where the author recounts how her parents met. But even these elements have great value if one wants to do follow-up research on any of the local social topics she talks about. Overall, this book is a valuable contribution to the understanding of Armenian history, not only at the local but also at the global level. Joan George, Merchants in Exile: The Armenians in Manchester, England, 1835-1935 (Princeton and London: Gomidas Institute, 2002). ISBN: 1-903656-08-7. Professor Benjamin F. Alexander is an historian of Armenian-American immigrant experiences. His research brings him frequently to the Zohrab Center, where is also assists as a consultant.